I enjoy creating dyes from natural sources because it forces me to slow down and appreciate what’s growing in my environment, which is a mix of suburbia and urban, surrounded by farmland. 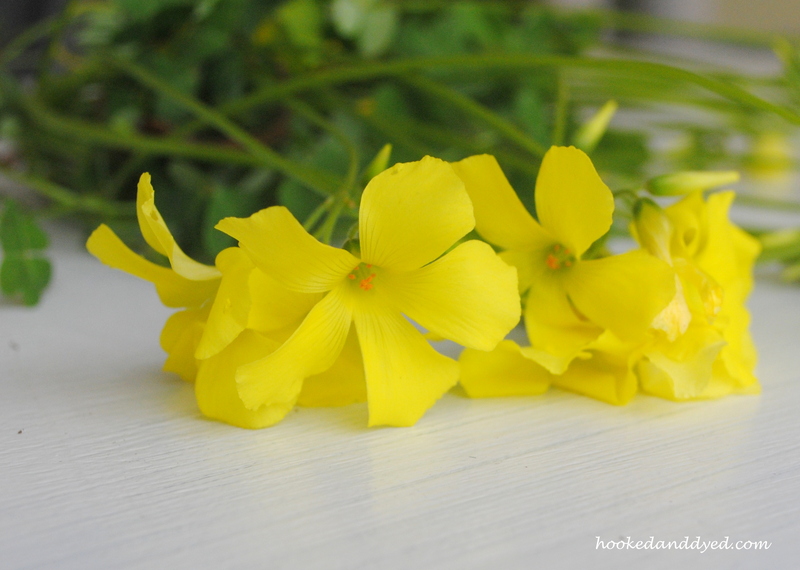 However, to be honest, I didn’t play much attention to Oxalis (aka sour grass, bermuda buttercup) until someone told me they make a natural dye. Then I noticed them popping up everywhere ~ along sidewalks, next to driveways, underneath mailbox posts. You get the idea. I quickly picked a large bunch during one of my daily walks, and brought them home for a quick experiment. I knew this would be an easy dye when they made yellow petal prints on my white table. I pulled the petals off the stem, put them in cold water, and brought them to a simmer in my small pot on the stove. The water immediately turned yellow. 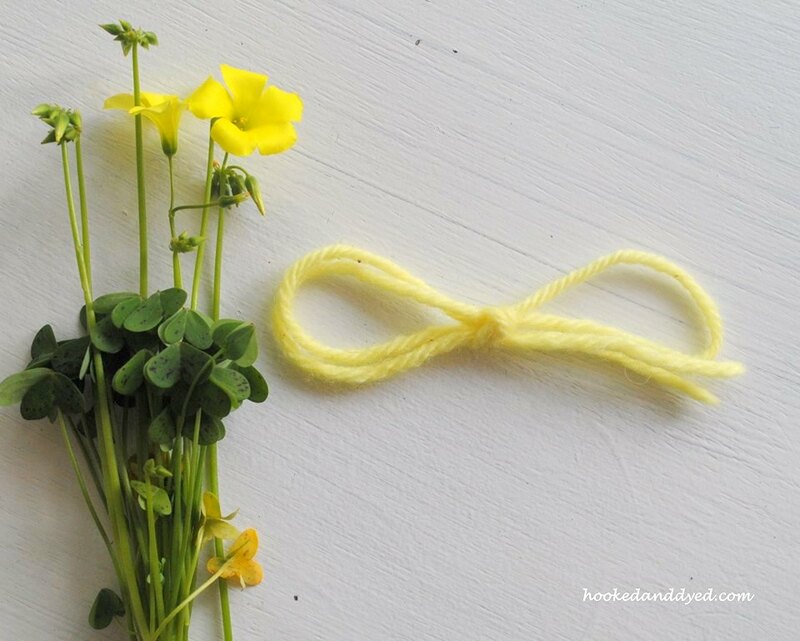 I threw in my alum wool sample, and was pleased when it turned the same vibrant almost neon yellow as the flower. When I posted a picture of this on my Hooked&Dyed FB page, a friend (and non dyer) commented “you mean that weed I have growing all over my yard?” *gasp* I think the term weed is a harsh term for a flower that is this cheerful. 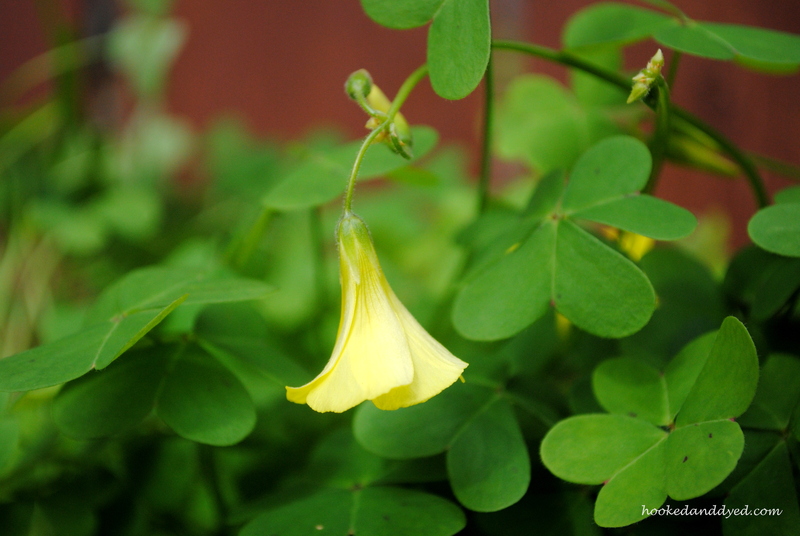 But yes, oxalis is technically a weed. A weed which also makes a gorgeous dye. It also looks lovely in a small vase on the table. It’s a sweet reminder that spring is here. Oh, I forgot you can eat it, too!